Youngsters from North and mid Wales will be singing in Disneyland Paris next weekend. They are among winners at last year’s Urdd Eisteddfod invited by organisers to help Mickey Mouse and his friends celebrate St David’s Day in the park’s Welsh Festival at Disneyland Paris. Rhys Meilyr Jones, a pupil at Ysgol Corn Hir is a regular winner at the Urdd and other Eisteddfodau. He will be joined by Llio Meirion Rogers from Ysgol Penbarras, Ruthin, Sophie Rudge, of Ysgol Penglais, Aberystwyth and Steffan Harri, Ysgol Caereinion, Llanfaircaereinion. Mickey Mouse dropped into the festival in Cardiff last year to announce an exciting deal between the Disney organisation and the Urdd. Disneyland Paris has celebrated all things Welsh at its annual Welsh Festival, where Mickey and Minnie appear in their traditional Welsh outfits, St David’s day fireworks lighting up the sky over Sleeping Beauty Castle, since 2005. The Urdd have organised trips to Disneyland Paris for several years. 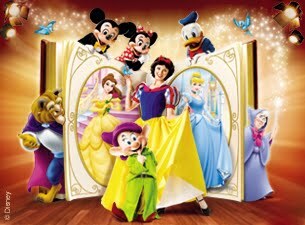 The Three Classic Fairy Tales, Disney Live! tour starts in Glasgow on the 5th March. The show features the stories of Snow White and the Seven Dwarfs, Cinderella, and Beauty and the Beast. Together with Mickey, Minne and 25 of their Disney pals.